Level III steps up the intensity and flair from the previous module to lift you to new heights of expression. Exploring more impactful syncopated rhythms, you will garner a wider repertoire of rhythm variations for further song applications. 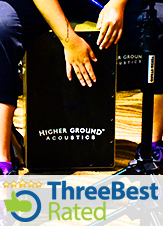 The in-class group synergistic exercises will instill a deep connection between you and your Cajon.